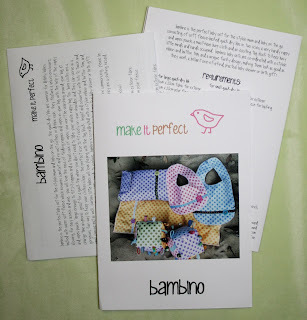 make it perfect: .bambino pattern. Bambino is the perfect baby set for the stylish mum and baby on the go. Quick-Dry Bibs - superior for dribbly babies, backed with super soft fleece which ensures comfort and no wet clothes or dribble rash. Nappies and Wipes Pouch - no more losing nappies and wipes in your bag! Large enough to fit 2-3 nappies and a travel pack of wipes, great for a quick trip when you don't need to take your whole nappy bag. 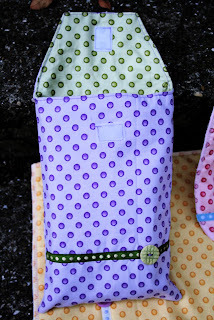 Burp cloths - a gorgeous, fun way to keep your clothes clean. The perfect size to fit nicely on your shoulder, and they can serve as a small change mat as well. 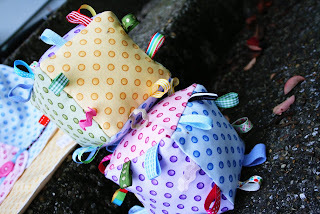 Tag Blocks - curious little Babies will love playing with the tag block. Bright and colourful with lots to touch and a jingle inside, they are perfect for little hands to explore. 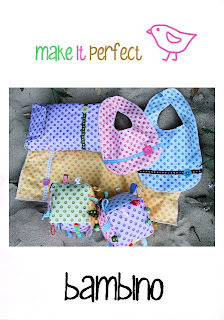 Bambino is co-ordinated with a stylish ribbon and button trim, and a unique funky design, making them look as good as they work, a brilliant one-of-a-kind, practical baby shower or birth gift! I think the Bambino range is a good one because it's so versatile.